Excited beyond all reason to be seeing Jonathan Slinger back with the RSC (he was triumphant as both Richard II and Richard III for the RSC Histories season) it was nonetheless with mixed feelings that I ventured forth unto the ‘cockpit’ of the RST. The production had generally good reviews – for ‘Slinger’s charismatic and terrifying Macbeth’ (Spencer. Telegraph. April 2011) and for the palpable, pervasive evil of the production. Some questions had been raised as to whether Boyd had in fact thrown too much at the play – creating a ‘visual coup’ but destroying ‘Shakespeare’s superbly atmospheric’ text’ (Billington. Guardian. April 2011) Finally –and most worryingly - my faithful Shakespeare buddy of old had sent me a message to say she had ‘not heard such good thing’. Oh. Dear. Well, in defence of the doubters, I can see the basis for their objections. The purists would no doubt have been horrified at the complete cutting of Act One Scene One. All those poor GCSE students who have spent hard working coursework hours writing about why the opening scene of Macbeth is so important, how it creates atmosphere for the whole play – completely gone. This was quite a shocking cut. There were also a number of lines spoken by different characters. The ‘bloody captain’ of scene 2 was in fact Malcolm – his words fed to him by a Priestly Ross who leant across the stage from the circle. However, this reviewer would assuage the doubts of those yet to see the production. This tragedy was muscular and powerful. 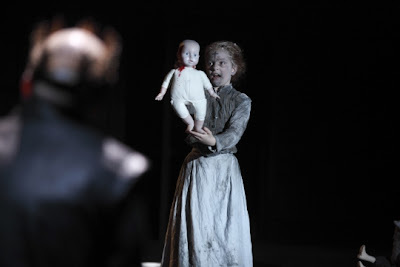 Despite the cutting of the opening scene and some serious editing, the production conveyed the full scale horror and sense of darkness that characterizes the play. Tom Piper’s stage design was a splendid backdrop for this – a little like being inside a desecrated Catholic Church. Stained glass windows were smashed. Painted saints had their faces scratched out. The floor piled high with rubbish and debris of statues. A hole in the wall let through a little light but as the production continued it was also used as a portal by the ‘witches’ and later Macbeth as he sought again his dark companions. One of the editing choices made by Boyd , which may have challenged the audience, was the exchange of ‘witches’ for three chilling children. (Not unusual as a choice – a 1997 BBC version of Macbeth set on a council estate featured three tearaway kids as the witch figures.) These figures were lowered inside the desecrated church on meat hooks as the horrified Macbeth knelt and crossed himself –at which point the seeming cadavers began to sing Agnus Dei. Seriously scary. Their prophetic tales were told with the use of tatty, bloodstained dolls and bloodcurdling banshee like cries. The production was marked by what I would describe as Boyd’s trademarks approaches. As with The Histories – where he famously described the play world as one in which ‘no one stayed dead’ – the world created for Macbeth was full of the returning deceased. So the three fiendish infants re-appeared as the children of Macduff. The scene in which the Macduff family are killed is always difficult to watch, but this production was truly distressing, with the fiery Lady Macduff wailing to the end as her vital energy slowly ebbed away; yet still these figures did not disappear, but rather making up part of the invading army that finally attacked Dunsinane. This added both to the drama and poignancy of the concluding scenes – with haunting cello music played – as Macduff gets a final, fleeting glance of his lost daughter, crumbling tearfully to the ground after Macbeths defeat. Such touches stressed the human cost of Macbeth’s Reign of Terror. Another touch that those Histories die-hards would have noted was the figure of the Gatekeeper ; a visual treat as the same actor played a fiery scarlet Porter and an incarnadined Seaton (whose name of course sounds remarkable devilish) welcoming the departed through his door. Finally, Macbeth headed this way as his victims left the stage. With more than a passing nod to Goold’s vibrant 2007 production of Macbeth at Chichester (see my older review), the first half concluded with the appearance of the bloody Banquo, attacking and killing Macbeth in a gruesome and gory knife attack whilst his courtiers look on amazed. After the interval the scene was replayed but with no sign of Banquo – making Macbeth’s grizzly death sequence hysterical in tone and comical in effect. The central performances were all suitable compelling. The wonderful Jonathan Slinger particularly came into his own as the rabid, wildly power-hungry, sleepless tyrant. With bursts of terrifying smiles and fervent flashes of rage Slinger was every inch the autocrat. It seemed that this was the heart of the performance, with the eponymous oppressor’s journey to despot a relatively short but brutal one. Aislín Mcguckin was a strong Lady Macbeth, convincing as a woman who could easily condone and participate in murder, but finally cracking under the pressure –the scene of her obsessive compulsive hand washing was distressing and boiling with impotent fury – qualities which should characterize Macbeth. Steve Toussaint as Banquo was a giant of man with a booming presence and his terrifying ghostly manifestation more threatening than his live counterpart – smashing his way through into the Macbeth’s family Feast. Aidan Kelly as Macduff was also suitably vigorous, convincing as both a solider and as a distraught father. Scott Handy added a concentration of poignancy to the play as Ross, the lost religious man,a relic from an older time whose obvious fondness for the Macduff family moved him to sobs as he beheld Macduff's grief. 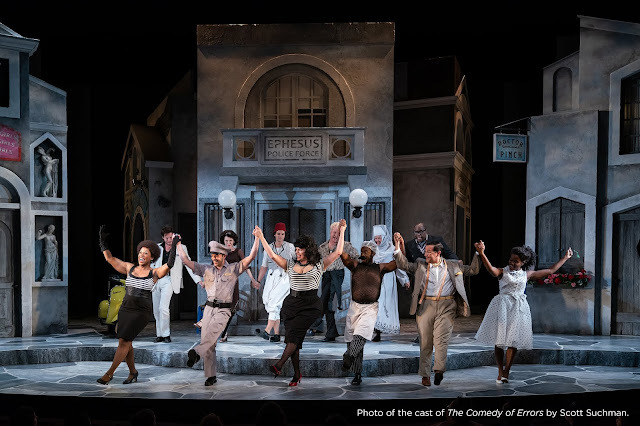 Boyd, as always, knows how to use the full potentiality of the thrust-stage space, with characters coming in from the audience, the flies, from every angle –truly three dimensional theatre. (Memorably when an ire-filled Macbeth stands atop a ladder which ascended from the trap, looking on at the invading army) Even a vision of Banquo’s future Kings’ fell from the flies- a myriad of tiny dolls with crowns – creating quite a visual coup. Another familiar Boydian touch was the falling of liquid form the flies- this time designating the anointing oil as Macbeth and his Queen are invested at Scone. This was a bold and powerful production, filled with pathos and poignancy as well as showing the brutal horrors to which humans can descend. Despite the controversial cuts, these hours of strutting and fretting, full of sound and fury, were well worth the watching.